When you need a medical gas installation in Virginia or medical gas pipeline installers, Lewis Systems has the NITC ASSE 6040 certifications and the experience to get the job done right. Installation of medical gas systems and pipeline equipment requires specially trained technicians to perform the job optimally with the utmost safety and security of your staff and patients in mind. We provide professional and certified medcial gas pipeline installers and equipment technicians at every Lewis Systems location. 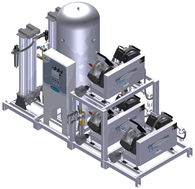 Lewis Systems can configure, provide, install, test, and maintain your medical gas systems and pipeline equipment, helping you get the configuration that meets your needs and keep your system running smoothly. Intelligent configuration and design will help you get the most out of your system while using minimal floor space that you need for something equally important. We’ll test your medical air system and service it on a schedule that’s convenient for you. Whether your business is a surgical center, healthcare facility, or medical treatment center, contact Lewis Systems for NITC ASSE 6040 certified medical gas installation in Virginia.